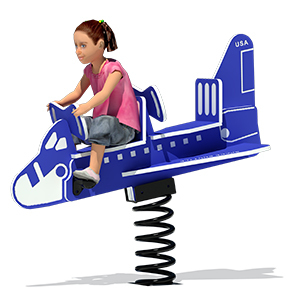 Kids will love taking turns being the pilot and co-pilot on this heavy-duty, polyethylene plastic Shuttle Rider. Featuring two seats and two steering controllers for double the fun. Designed with two sets of foot pegs for safety. Shuttle available in colors as shown only. 14' 3" x 17' Use Zone. The shuttle rider is mounted on a heavy-duty, black spring that can be surface mounted to concrete with J-bolts. The spring is powder-coated with a triple flo-coated corrosion protection for a superior, high gloss, no peel, no flake finish. Manufactured and tested in accordance with ASTM standards.